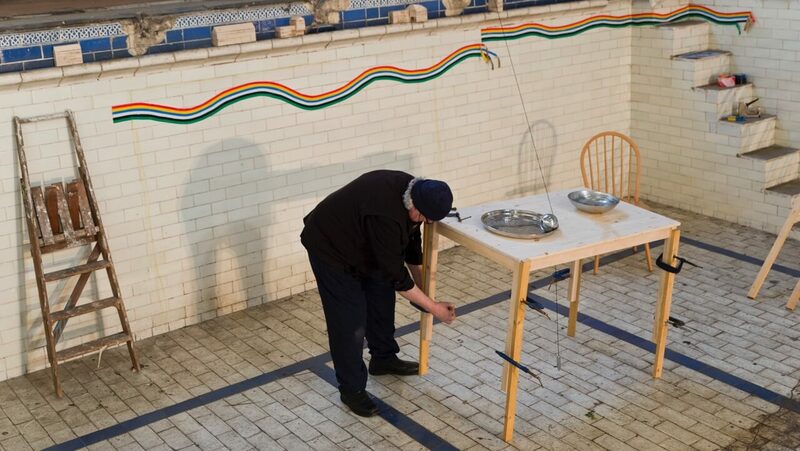 ‘Water Table’ Durational Performance, The Old Swimming Pool, as part of ‘Against The Light into the Headwinds’ Exhibition, The Bath House & Swimming Pool, Glenmore Street, Belfast, March 2017. Photo by Jordan Hutchings. Brian Connolly was born in Ballymoney Co. Antrim in 1961 and was awarded an M.A. in Fine Art at the University of Ulster in 1985. He has been working as a professional artist ever since. As an artist much of his past work has evolved out of a series of dialogues with the specifics of place, location, context, or site. He has created Interventions, Performance Art Works, Install-actions, & Installations, in a wide range of places both locally and Internationally, these include: Churches, Monasteries, Castles, City Streets, Squares or Alleyways, Market Places, Parks, a River Source, Beach, Funeral Parlour, as well as Art Galleries & Museums. He has also a broad experience with Public Art Commissions and Art Commission Processes, as a Commissioned Artist, as a member of Design Teams, and also as part of organising committees and selection panels. He has created durable Public Artworks for a range of locations including: Dublin Port, St. Anne’s Square, Belfast, Royal Victoria and Antrim Hospitals, Microsoft Ireland’s Headquarters in Dublin, Knockbracken Healthcare Trust in Belfast, Coleraine Borough Council, a Belfast College, and Plumbridge Community in Tyrone & Ramelton in Donegal as part of the Heart Sculpture Trail. He is currently an Associate Lecturer in Fine & Applied Art, Sculpture, at the University of Ulster, Belfast where he was involved in the evolution of “Interface” which led to the Art & Design Research Centre, at the University of Ulster. He has served on the management committee of BBeyond as Chair and Vice Chair, and the former Moyle Art in Public Places, all which initiated and developed projects that deal with aspects of contextual art. He established the Belfast International Festival of Performance Art in 2013, an annual festival supported by Cultural Development within the University of Ulster. He has also been the Northern Irish Artist Representative for Visual Artists Ireland. Specialties:I currently work with Performance Art, Public Art, and many Site-specific art stratigies. I am an artist organiser and currently generate projects within Bbeyond. I have artistic links within the Performance Art Network and work internationally as well as locally.